Hiking the Noosa National Park, Qld. Torndirrup National Park Hikes, W.A. 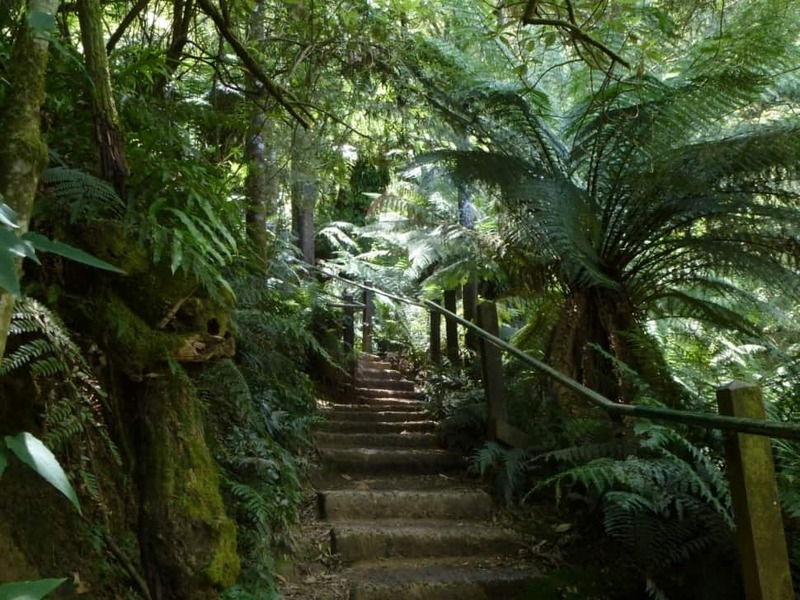 By Nina Burakowski, also see Margaret River’s best walking and hiking trails. Scenic Walkway in the Blue Mountains, N.S.W. 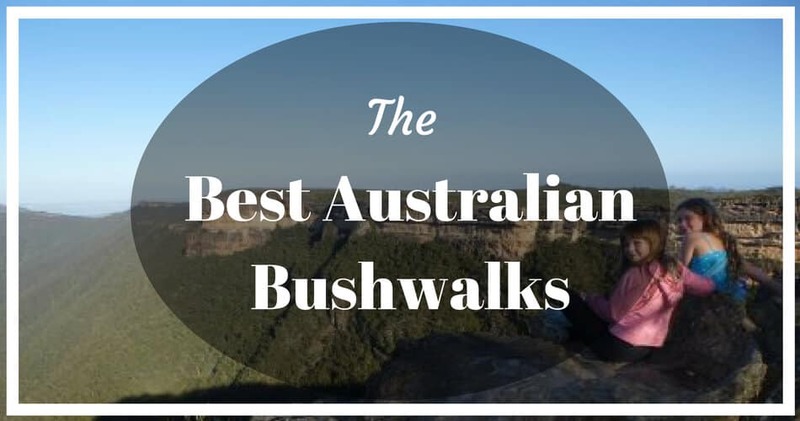 We have some of the best bushwalks for all fitness levels in Australia. 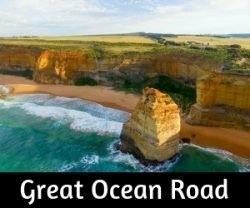 National Parks, coastal walks and mountain trails are featured here, written by travel bloggers from around the world. Many of our road trips include bushwalks, the East Coast drive is one of the best routes for hikes and activities. One of my favourite places to hike is through the Noosa National Park because you get a little bit of everything – bush, wildlife, stunning coastal views and several spots to swim. 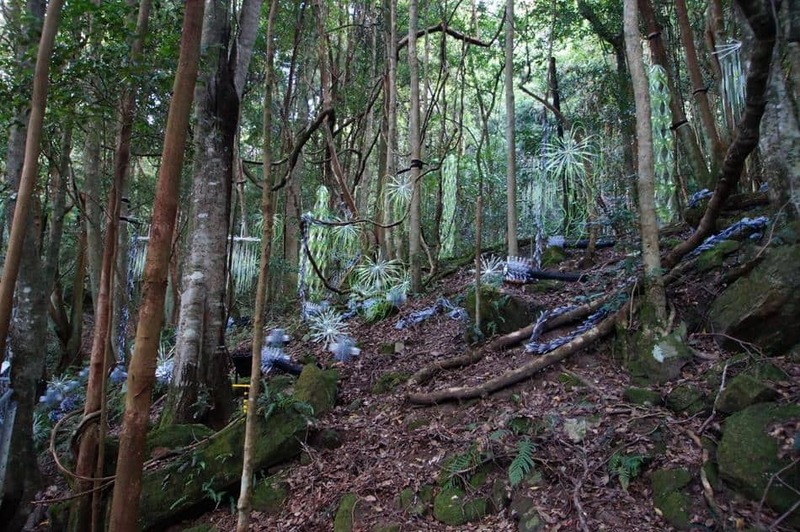 There are 5 different walking track options in Noosa National Park ranging from a short bush walk to a few hours hike. The official entrance/starting point is along Park Road not too far from Hastings Street, this is the ideal spot if you want a short walk. However, for the longest walk, the Alexandria Bay track, I like to start from the Sunshine Beach end. 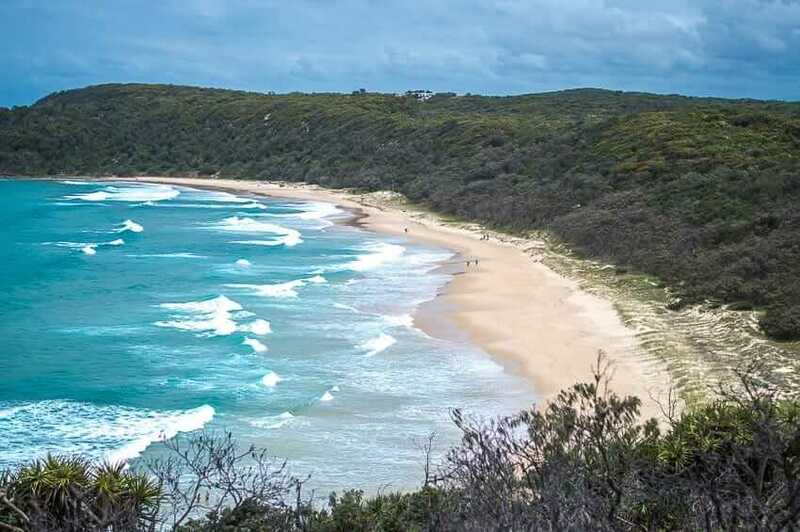 The Alexandria Bay track is 4.6 kilometres and incorporates the popular 2.7 kilometres coastal track which takes you past all of the stunning Noosa National Park beaches as well as the Hells Gate’s lookout point. We like to pack some snacks and stop at the various beaches along the way making it into a good half day trip. Whilst inland keep your eyes peeled for koalas, echidnas, giant monitors and birdlife. Whilst along the coastal track you can spot marine life such as dolphins, turtles and manta rays. Torndirrup National Park is located 15kms south of Albany on the Great Southern Ocean in South Western Australia. There are two reasonably challenging hikes in the park that takes you completely off the beaten track over granite boulders, through dense shrubbery and coastal heathland. Peak Hike 4.3 km return walk to the peninsula’s southernmost peak can be reached via a rugged path that is steep in sections. Some rock scrambling is required to reach the summit. 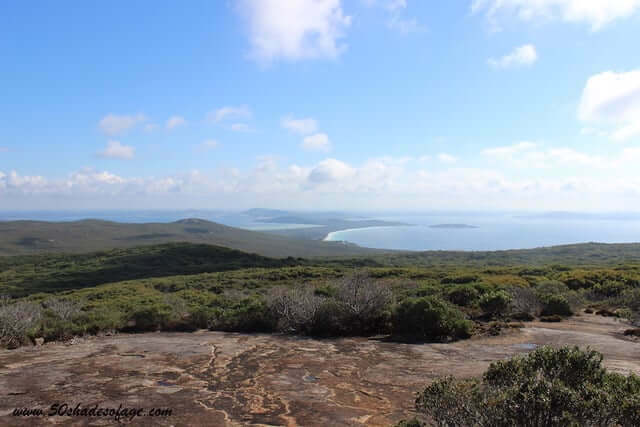 Bald Head Hike is 12.5 kms return, a challenging walk, with outstanding views, that leads over Isthmus Hill to Flinders Peninsula and on to Limestone Head and Bald Head. The terrain is steep and difficult in sections. It is without a doubt one of the most ruggedly beautiful national parks I discovered on our travels. From every aspect and every angle, there is a view to simply die for! The Cape to Cape Track in West Australia’s Margaret River region is Australia’s longest coastal walk. The 135km long trail starts at Cape Naturaliste near the coastal town of Dunsborough and ends at the Cape Leeuwin Lighthouse, Australia’s most south-westerly point. 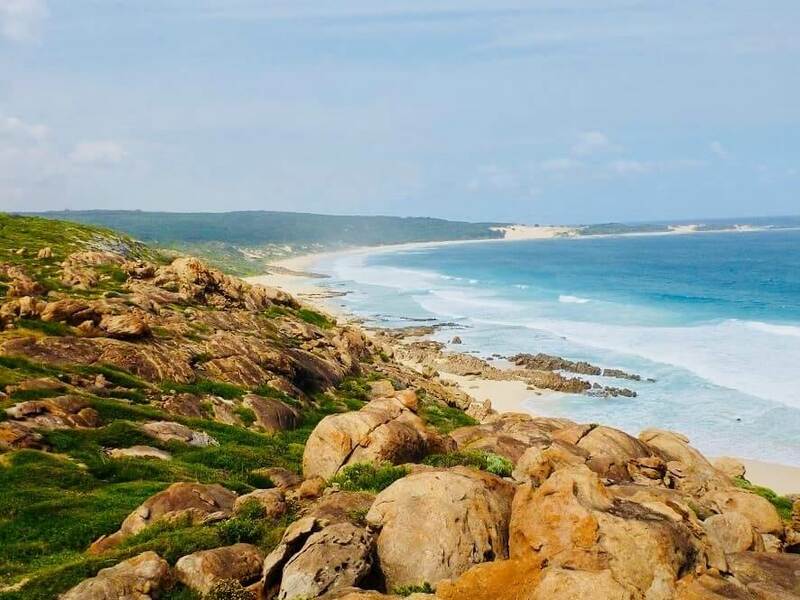 The trail passes through the magnificent coastal and forest scenery of the southwest region, taking in most of Cape Leuwin Naturaliste National Park along the way. 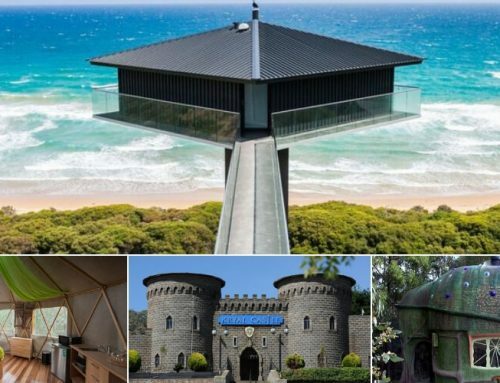 Highlights include the region’s rugged beaches and world class-surf breaks, impressive sea cliffs, towering Karri trees and seasonal wildflowers. Completing the trail from end to end takes between 5-7 days. The trail can easily be accessed from many of the carparks along the coastline and can be walked section by section. For multi-day hikers, the trail passes through caravan parks, towns and designated campsites that offer basic facilities such as water tanks. Nil Desperandum is a historic homestead that is situated in Tidbinbilla Nature Reserve, in the Australian Capital Territory. You can either start the hike at the Visitors Centre (13.8km round trip, approx 4 hours) or you can start from Greens picnic area (8.6km round trip, approx 3 hours). This is a moderate level for hiking. 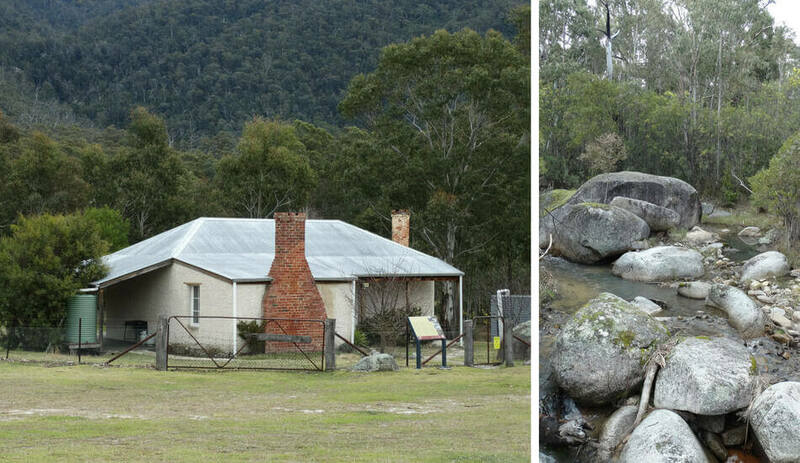 This hike is through the Australian bushland before you end up at this beautiful European homestead, the perfect place for a lunchtime picnic. You can even hire the homestead and spend the night in the Australian bushland. The track is well maintained and is home to plenty of kangaroos, wallabies and koalas (watch out for snakes in summer). This really is a truly Aussie bushwalk! The 1000 Steps walk in the Upper Ferntree Guly section of the Dandenong Ranges National Park is a tribute to the Kokoda Track in P.N.G and has numerous plaques about the track as visitors walk the (not quite) 1000 Steps through the stunning cool temperate rainforest, often seeing beautiful Lyrebirds on the route. There is a loop that can be done instead of returning down the steps, it is just over 4 km’s and steep going for the 1000 steps section. 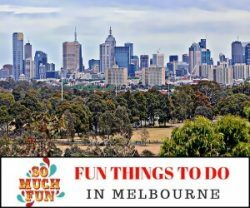 Many people from Melbourne use it as a fitness trail, so it does get busy but is well worth the effort. 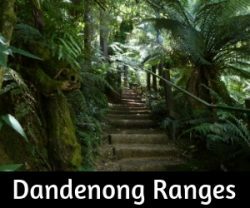 Starting from Upper Ferntree Gully Picnic Grounds on the corner of the Burwood Highway and Mt Dandenong Tourist Road, the walking track is well signposted. 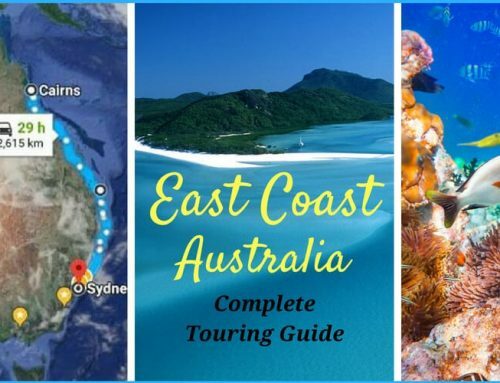 The Bouddi Coastal Walk is one of the best in New South Wales, covering a section of the Bouddi National Park coastline just across Broken Bay from the northernmost Sydney beaches. The Coastal Walk starts from the National Park car park at Putty Beach, near Killcare, and continues for 8km (5 miles) to MacMasters Beach. The walk actually feels longer than this because there are so many up-and-down sections, mainly steps up and down steep hills. 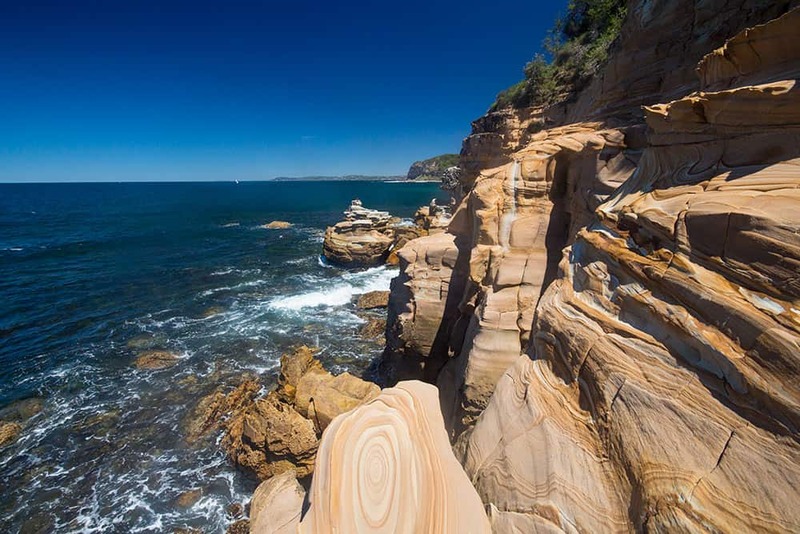 It’s a real connoisseur’s bushwalk, with some outstanding beaches (Maitland Bay and Bullimah Beach), amazing rock patterns and formations, cliffs and coastal moorland all within these few kilometres. Maitland Bay is the most beautiful spot on the walk, a glorious curve of golden Pacific sand which, because of its location is always quiet. It has some incredible rock patterns in the cliffs at one end, the circular liesegang rings like psychedelic paintings from the 1960s. You could take a shortcut down the Maitland Bay Track to the beach, but it’s a stiff climb back up to the car park. Otherwise, you can reach the Bullimah Spur walk (1 km each way) from this track, which gives some of the best views on the Central Coast. 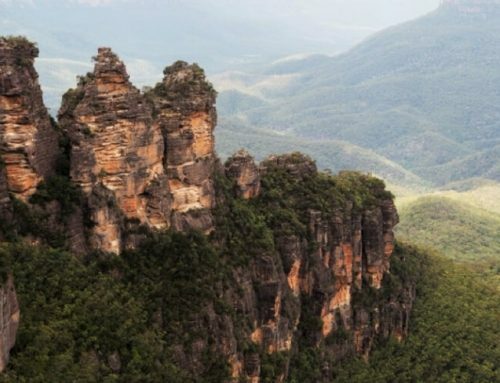 The Blue Mountains are one of the best day trips for everyone who lives or is currently based in Sydney. 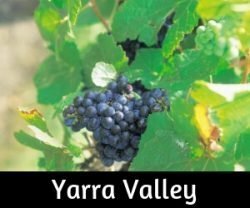 A quick hour drive from the Australian metropolis will get you in the heart of the mountains. When reaching the Blue Mountains, we sometimes feel as if we have just reached a completely different country. It feels super rural, super sleeps and just very comfortable. Apart from all restaurants and cute cafés, the Blue Mountains are one of the best spots to go for some hiking adventures: for our outdoor adventure, we chose the Scenic Walkway which is part of the Scenic World, an outdoor park that consists of several attractions such as a cable car or a railway. The Scenic Walkway is a 2.4-kilometre bushwalk through a landscape that is a great mix of Jurassic Park and a proper rainforest. Thanks to some great descriptive posters, you’ll learn a lot of things about the local flora and can listen to the native lyrebird. The best is, that every visitor can choose his or her own distance as there are different walks ranging from ten minutes to an hour. After the walk, we also went to experience the other attractions which were good fun and got us so super close to sights such as the Three Sisters. Australia’s highest mountain may not be that tall, nor a spectacular peak, but it’s still a lovely walk – especially when the summer wildflowers are blooming. Plus it’s the easiest way to be on top of a whole continent. 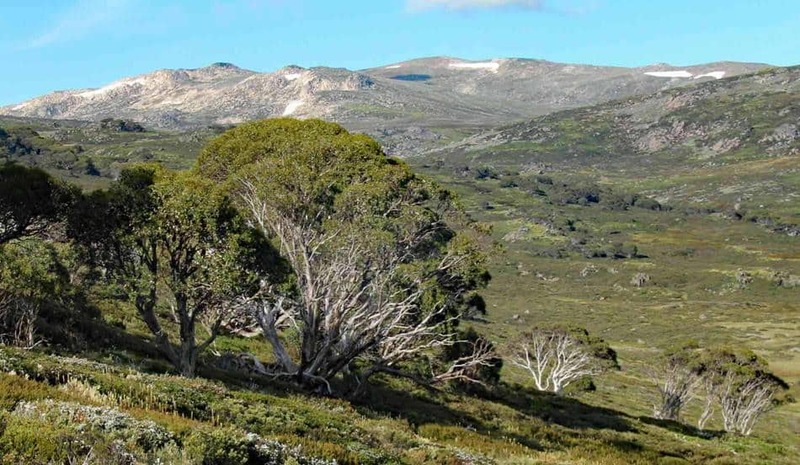 Most people climb Mount Kosciuszko from Thredbo, as a 13-km return hike from the top of the Kosciuszko Express Chairlift. You can also skip the chairlift using Merrits Nature Track (3.7 km), or take a longer route up (or down) using the Dead Horse Gap and Thredbo River tracks (10 km). Another option is a 25-km loop hike from Charlotte Pass, which passes several lakes including the stunning Blue Lake. Both Kosciuszko trails are mostly very wide, paved in parts and virtually impossible to miss in summer. The tracks up from Thredbo are also good and well signposted. So there’s no excuse not to make your pilgrimage up Mt Kosciuszko! Carrying on the tradition of intriguing Aussie place names, the Walls of Jerusalem is one that definitely doesn’t disappoint. Often overshadowed by its more famous neighbour, Cradle Mountain, the Walls offer a similar dramatic landscape but are much more untouched and see far fewer visitors. The hike is just under 21km long and starts at the end of a 30km dirt road. We warn you: it is uphill from the start. 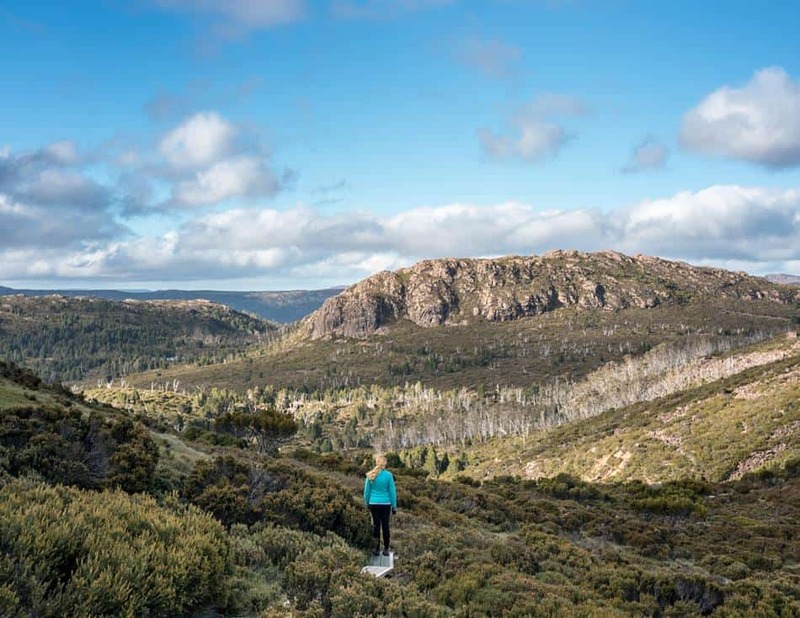 In the first 3kms, you’ll climb up 600m of elevation to reach the Central Plateau: a place so different to anywhere you would normally associate with Australia. Up here the land is covered in moss and lichen, colouring the landscape orange and green. The views are staggering as soon as you rise above the bushline, and you already feel it has been worth it before you reach the pinnacle of the walk, the Walls themselves. The Walls are towering mountains, and you can climb as high as you dare. You’ll feel the temperature dramatically drop and during December we endured 5C in the day and 2C at night! It’s safe to say that this part of Tassie never sees summer. There are plenty of side trails and places to explore and you’ll feel truly disconnected from the world up here. We’d recommend camping overnight at Wild Dog Creek campsite, but you can make it on a very long day walk. If you would like to add to the walks on this page, please contact us. Yes, so many walks and so many more to add too!